Born in Germany, is a 2nd year International Business and Management Student at Avans University in the Netherlands. She is partaking in the double degree program with ESB Business School in Germany. As a participant in the Challenge Program, Alina is one of the top 15 students in her year. She has international experience, having lived in Germany, the US, the Netherlands and Mexico. At the moment, Alina is completing an internship at Volkswagen de Mexico in the Quality Management department. Her future career plans include a gap year of volunteering, followed by a Master’s degree in finance or strategy from one of the top universities worldwide, and to start working for an internationally renowned consultancy firm. LISA SCHNELTE is a German second-year student studying international business with a major in cross cultural management. Therefore, she also study Spanish and Chinese and in her third and fourth year she will study non-profits, human rights and fundraising. She has worked in a German manufacturing company for two years. There, she gained experience in accounting, sales, distribution and purchasing. She also lived a year in the USA to study and work. In her free time she likes to volunteer, meet friends, do sports such as running, going to the gym and playing basketball. For the future, she is planning to study business psychology as a Masters. MAX DE LA CROIX is a second year International Business student at the Avans University of Applied Sciences in the Netherlands. Currently, he is interning in Edinburgh, working on Recruitment and company processes. One of the top students among his peers, Max is dedicated and passionate about being able to make a change where it counts. He will bring a well-rounded approach to business to the competition in Guatemala. 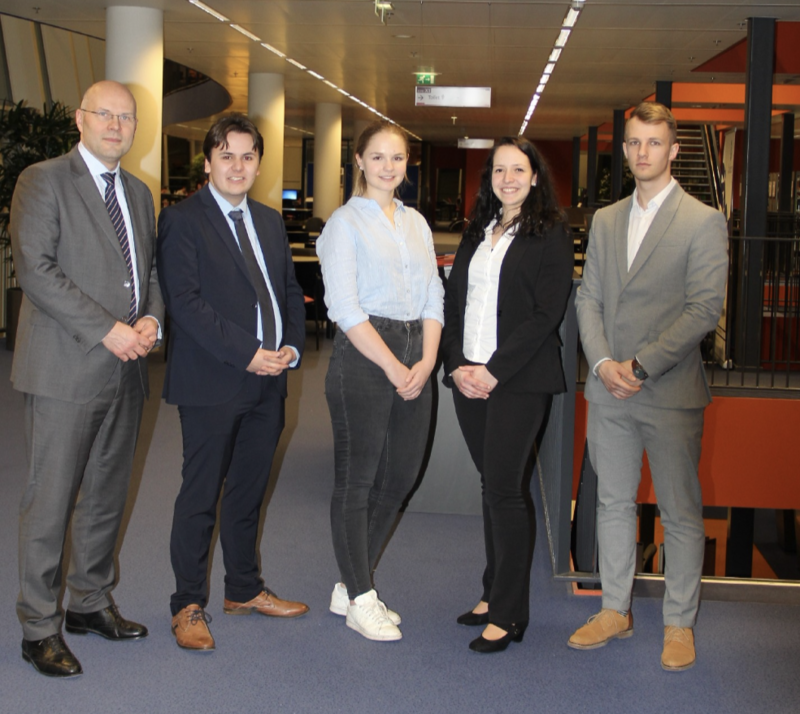 After finishing his studies at Avans, Max plans to pursue a Master’s Degree in International Business and seek further challenges and opportunities around the globe. Virgil van de Gevel (Coach), Max de la Croix, Alina Riecker, Lisa Schnelte and Patrik Kurilla. research at Manu National Park in Peru. Currently, he is preparing to begin his work-placement at Amgen Europe, where he plans to further develop his business carreer. VIRGIL VAN DE GEVEL (Coach) teaches different courses in the field of Marketing, Strategic Management and Marketing Research. He has marketing management and marketing research experience with blue chip companies: Campina (dairy), Novartis, T-Mobile, Sara Lee and PepsiCo. At the moment he is specializing in data science. He is also member of the Examination Board and examiner of the Dutch Marketing Institute which provides qualifications at Master’s degree-level for experienced marketers.